What time is it in the world? 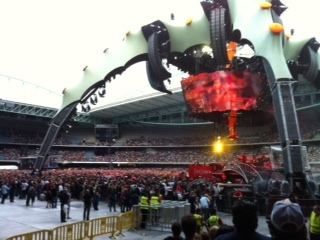 It’s this question that is offered throughout U2’s latest tour called 360 Degrees, which I was very lucky to see in Melbourne last night at Etihad Stadium. As we approached the venue on foot we could see a pointy spire poking through the open roofed stadium, a first glimpse that something big awaits inside. And sure enough as we enter we’re greeted with a large structure that resembles a space ship – and it’s big. Really big. It looks like it has just landed and all these people have gathered around to greet Aliens. Jay Z, the opening act, was good. Bass thumping in the chest kind of good, and the crowd in front of the stage seemed to enjoy it too with bouncing bodies and flying fists. I actually had no idea who Jay Z was, much the same way I didn’t know who Kanye West was the last time U2 were in town; yeah this might seem hard to believe to some, and perhaps I need to get out more! So, as 9pm fast approached, an hour after Jay Z disappeared in a cloud of aww yeah’s, the last remnants of summer daylight faded and then David Bowie’s lyrics filled the air… “planet earth is blue and there’s nothing I can do…” then screams from our right, and then all around us, as four 50-something blokes dressed like 20-somethings swaggered& out – Bono, Adam, Larry and “The Edge” – casually strolling to the spaceship, like they’re ready for an International flight at the airport and sixty thousand close friends are there to see them off. My first glimpse of Bono, bigger than a matchstick this time (last time I saw U2 my seat was miles away), but still looking like the short man he is, clad in leather pants and jacket and those trademark sunglasses, and I don’t feel a bit jealous because I wouldn’t be dressed like that on such a balmy summer night, and certainly not under those spaceship lights. 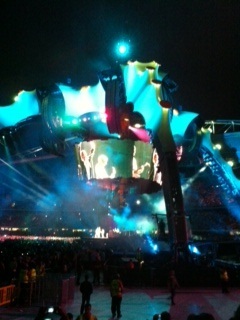 There’s no denying it, U2 know how to put on a show. 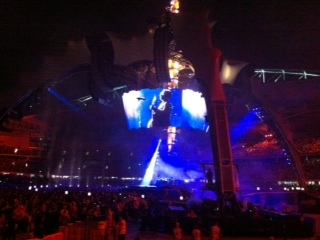 The spaceship impresses on every front as it changes colour with almost every song, and the 360 degree stage and incredible LED video screen entertain throughout, with collages of live video on-stage and many other clips including at one point, Desmond Tutu, and some Russian cosmonaut. “We’ve been doing this a while”, Bono announces at one point, “but we’re still learning.”, he shouts as he segues into Still Haven’t Found What I’m Looking For; And that’s the good thing about seeing U2, they play many of the songs that everyone knows, not some latest album they’re trying to get punters to pay for. And so, What time is it in the world? Well, you’ll just have to get along to the show (or buy the DVD) to find out!